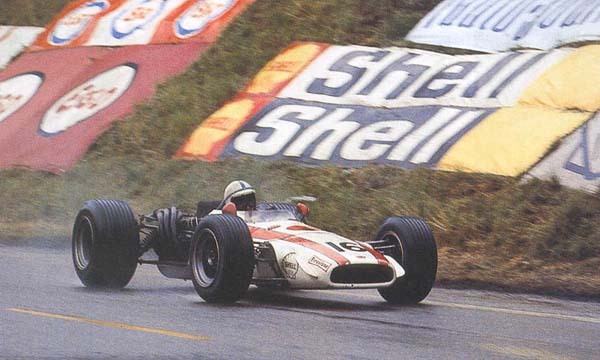 For the first time since Dan Gurney’s triumph in 1964, F1 returned to Rouen. Following 1961 it had been decided to rotate Formula 1 through the three main French circuits – Rouen, Reims and the new Clermont-Ferrand. 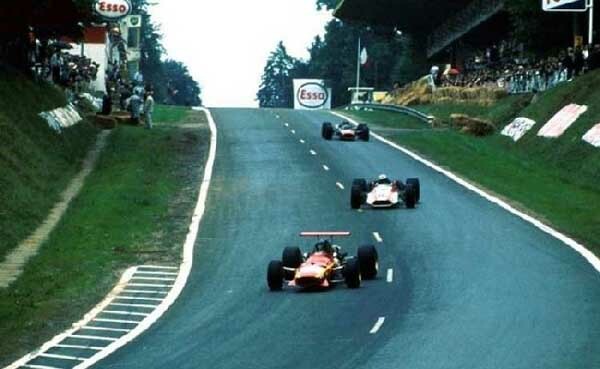 1967 had been scheduled to be the next turn for Rouen, but politics had instead seen the race awarded to the Le Mans Bugatti circuit, a track famously described as “Mickey-Mouse” by Graham Hill. 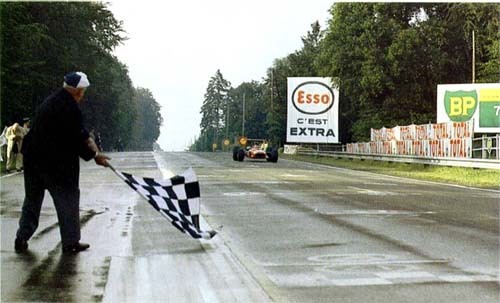 After that less than edifying experience, Rouen was rightly awarded the French GP for 1968. 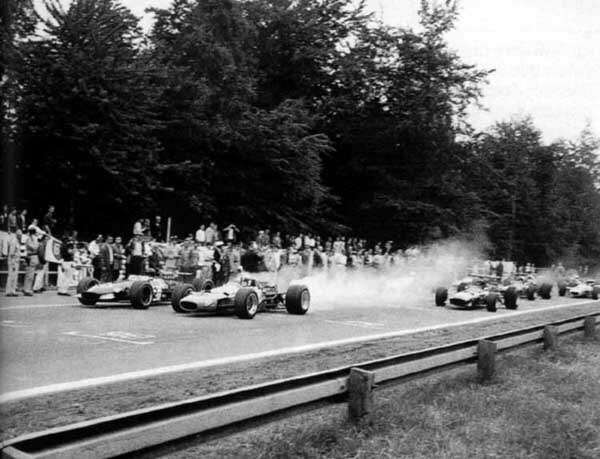 Instead of solidifying it place as France’s number-one circuit though, 1968 would mark a huge change for the circuit, and begin the circuit’s slow spiral into oblivion. Much interest revolved around the newest car on the grid: the Honda RA302. A completely different beast to the RA301, the 302 was expected to be the next step towards Honda being a real force in F1. John Surtees was slated to drive it, but concerns about stability in testing coupled with parts issues persuaded Surtees to stick with his trusty 301 for the weekend. Honda had other ideas though, and advised that the 302 would be running, and if Surtees wasn’t going to drive it, then local driver Jo Schlesser would. This controversy ensured all eyes would be on the Honda team. 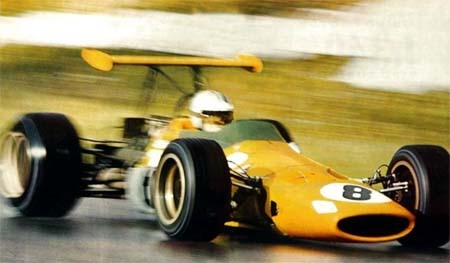 Bruce McLaren brought two of his yellow cars over for himself and defending World Champion Denny Hulme, while two Ferraris were entered for Chris Amon and young Belgian Jacky Ickx. BRM had their usual two cars for Pedro Rodriguez and Richard Attwood, Parnell had a BRM for Piers Courage, and Lotus had two Gold-Leaf liveried cars 49Bs for Graham Hill and Jackie Oliver. Jack Brabham brought two BT26s for himself and Jochen Rindt, with a BT24 as a spare, Ken Tyrrell had a Matra MS10 for Jackie Stewart, and Jean-Pierre Beltoise had a V12-engined MS11. 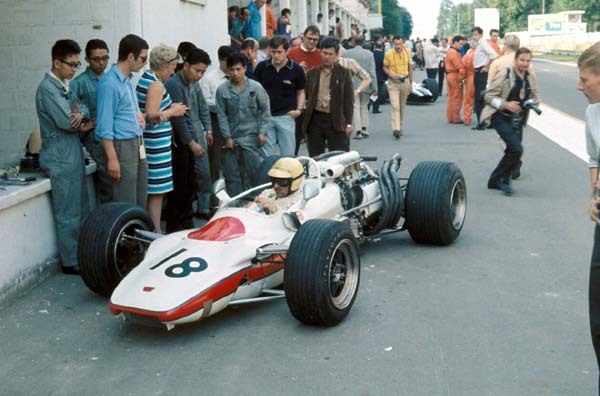 The Cooper-BRM team was in a bit of turmoil, with no really experienced drivers available they turned to Vic Elford, with no F1 experience at all save for a brief test the previous year, and Johnny Servoz-Gavin. John Walker’s Lotus 49B for Jo Siffert rounded out the entrants. Much had changed in the four years since the F1 circus had last been to Rouen. In 1964 the 1.5-litre rule was in force, and rear wings were not even thought of at the time. 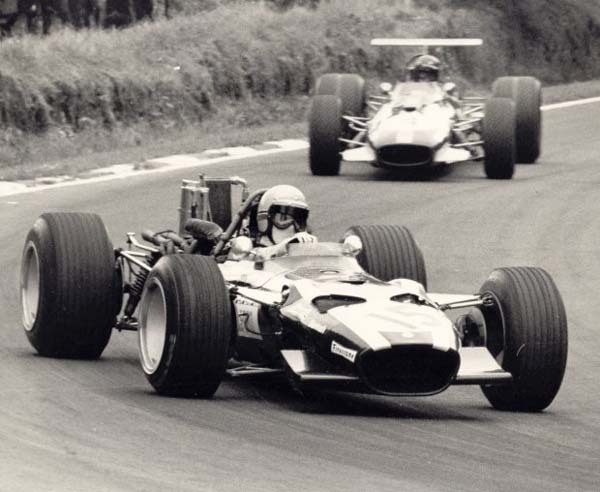 Powerful 3-litre engines, bigger wheels and tyres, and experimental wings for 1968 meant the existing F1 record of 2m 11s set by Jack Brabham wouldn’t just be beaten, it would be obliterated. Indeed, Jochen Rindt’s fastest lap for the 1967 F2 Grand Prix was 5 seconds faster than Brabham’s 1964 time, and so times in the late 1m 50s bracket were expected. 10 seconds in four years, that’s progress for you! A very brief 45-minute afternoon session was set aside for the F1 cars on the Thursday, just enough time to get a reasonable time in and if anyone encountered any problems there would be time to fix them. Rindt duly picked up where he left off in 1967, with a scorching 1m 56.1s time almost 2 seconds faster than anyone else, and a full fifteen seconds faster than the 1964 best. Amazing. The two Ferraris were next up, Ickx going 0.1s faster than Amon. Hulme was happy with his 1m 58.2s time, and team boss McLaren was just 0.2s slower. John Surtees had the Honda RA301 really moving and recorded a time similar to Hulme, but team-mate Schlesser was having a number of problems with the brand new RA302, and an off-track excursion which damaged a wheel curtailed his the session for him. 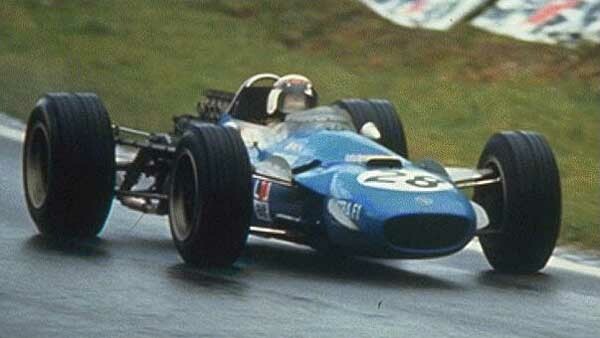 Jackie Stewart decided to have just a few laps, his 1m 58.7s time very quick in the circumstances. The BRMs of Rodriguez and Attwood had no problems but weren’t overly quick, while the same couldn’t be said for the Parnell BRM of Courage, which struggled with multiple problems. Lotus were struggling with their rear wings, at one point Hill reported the front wheels coming off the ground, so much downforce was being created! Hill finished with a best of 2 minutes, team-mate Oliver a couple of seconds slower. 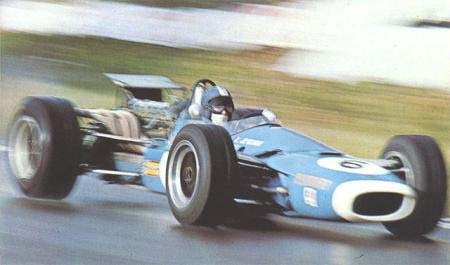 Beltoise went alright but wasn’t particularly quick, Servoz-Gavin did well in his Cooper, while Jack Brabham was plagued with problems and abandoned the problematic BT26 to use a BT24 for the rest of the session. Siffert was having nightmarish handling problems with his Lotus and couldn’t set a fast time, while Elford’s first competitive taste of F1 lasted just two laps when he suffered an engine problem. 80 minutes were set aside for session two on the Friday, and while this was better than the 45 mins on Thursday it still wasn’t enough for a number of the teams. Jochen Rindt spent most of the session sitting in his stationary car while his mechanics worked feverishly behind him on a fuel pump problem. Fortunately for him, his previous day’s time was more than good enough to secure pole for the race. Jackie Stewart did the minimum of laps required to get himself second on the grid, his 1m 57.3s time the fastest of the day. Ickx rounded out the front row, as both he and Amon struggled with their Ferraris and had to rely on Thursday times for qualification. Amon was on row 2 then, with Hulme beside him in 5th. Hulme was much the happier of the two drivers, having managed a time half a second quicker than Thursday. McLaren’s im 58s time secured 6th spot for him, just ahead of Surtees and the much-improved Beltoise. Hill was next in 9th alongside Rodriguez, then came Oliver, Siffert, Attwood, Brabham way down in 14th, Courage and Servoz-Gavin. Rounding out the field were the very slow Schlesser, who was really struggling with the troublesome RA302, and Elford, who was still really learning the F1 game. After fielding a number of complaints about the lack of practice opportunities they had been given, the AC Normand gave permission for an untimed session early Sunday morning. As the teams gave their cars a final tune-up for the race, Jackie Oliver became the first real casualty of the weekend. 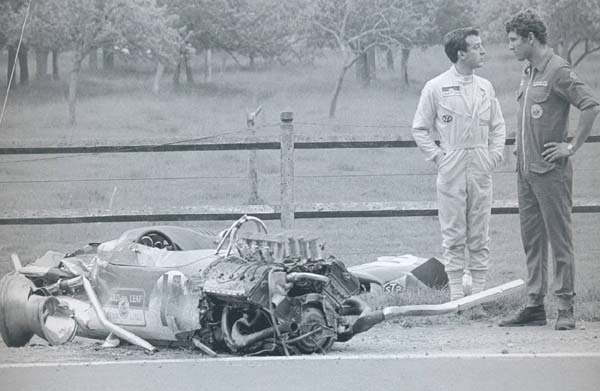 He lost control on the straight before Paradis, the car turning left at 120mph and disintegrating. Miraculously Oliver was unhurt, and there was some conjecture as to what had caused the accident. Oliver himself was convinced something at the rear of the car had broken, but it was also surmised that the rear wing could have caused the accident as he was behind Siffert and Attwood at the time of the incident. Either way, his weekend was run as there was no spare Lotus on offer. The other teams tried to get their cars as ready as they could, but drivers were still having issues with their cars, notably Rindt and Brabham who were having fuel feed problems, and Schlesser, who once again damaged a wheel. The support races had all been run on a dry track, but now rain began to fall as the F1 cars lined up for the start, everyone on dry tyres to start with as there was no time to change to wet tyres. Stewart got the jump to lead down to Nouveau Monde for the first time, Rindt and Ickx keeping him honest. Most expected Stewart to take up where he left off at Zandvoort but Ickx was already showing his Ferrari to be much better in the wet conditions and he had a lead of a number of length at the end of lap 1, ahead of Stewart and Rindt. Surtees was 4th, ahead of Rodriguez doing well in 5th, Hill 6th, McLaren 7th, and Beltoise 8th. Amon’s Ferrari was sounding rough as he dropped to 9th, ahead of Hulme, Attwood, Brabham, Elford, Courage, Schlesser and Servoz-Gavin. Siffert was already a minute behind at the back, his car had struck clutch problems at the start and his mechanics got him going albeit belatedly. After two laps Ickx was pulling away, Rindt had grabbed second from Stewart, while Surtees, Rodriguez and Hill were closing on the Scot. On lap 3, tragedy struck. Jo Schlesser, who had struggled all weekend with the new Honda, spun at Six Frères. Witnesses stated that they thought his engine had cut out, and the Frenchman was a passenger as his car slithered up the embankment, overturned, and burst into flames. Spectators near the incident suffered minor burns as the magnesium-built car burned fiercely, Schlesser stuck underneath. Efforts were made to retrieve him, but the combination of the intense heat and the lack of chemical fire extinguishers made that task almost impossible. Water extinguishers were used but they made no impression on the flames, instead merely making matters worse allowing rivers of flame to flow down the circuit. Before long it became clear that nothing could be done, and poor Schlesser perished in the flames. It would be almost 20 minutes after the initial crash before he could be pulled from the charred wreckage. This tragedy cast a black cloud over the whole race, and would have far-reaching consequences for both Rouen and the Honda team. The race continued, the drivers picking their way through the debris. Ickx still led, with Surtees and Rodriguez now second and third after they passed both Rindt and Stewart. Rindt was a victim of the debris on lap 4 when a piece of wreckage popped one of his rear tyres. He trailed into the pits to find Brabham already there with continuing fuel pickup problems, so the mechanics grabbed a wheel from Brabham’s car, fitted it to Rindt’s and sent the Austrian on his way. On lap 5 Ickx’s lead was virtually nothing as Surtees and Rodriguez closed right up, while Hill closed up on Stewart’ whose car was not enjoying the conditions much. In the next two laps though, Ickx went right away again, opening the lead to 5 seconds from Rodriguez who had managed to get by Surtees into second. After 10 laps Ickx led from Rodriguez, Surtees in third, then Stewart, Hill, McLaren, Beltoise, Courage, Amon, Hulme, Elford, Attwood, Servoz-Gavin and Siffert. Hill managed to get past the struggling Stewart on lap 12, but then suffered a driveshaft failure and retired two laps later. 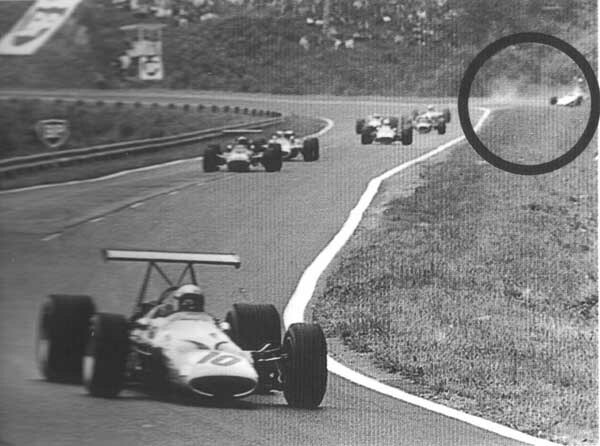 Siffert, who did not have a visor for his helmet, then stopped to allow Hill to give him his near Sanson. He then got back underway, clearly last. Servoz-Gavin’s race came to an end shortly afterward when he crashed into a tree, thankfully emerging unhurt. Lap 19 saw Rodriguez set the fastest lap of the race, a 2m 11.5s, and he topped that by getting past Ickx for the lead, taking Surtees with him, and leaving the Belgian surprised in third. It was a temporary state of affairs however, and Ickx quickly got back past Surtees and then dealt with Rodriguez on lap 20. Surtees had had a nasty moment when a stone from Rodriguez’s car had struck his goggles and shattered a lens, but he continued as if nothing had happened. The incident did mean he was now being blinded by the spray. Stewart ducked in for wet tyres on lap 24, allowing the impressive Courage by into 4th. Soon after he had to pit when a fuel tank came loose, dropping him seven places while it was fixed and wet tyres fitted. Ickx now really rocketed away, turning the race into his own private fiefdom. By lap 30 his lead was over a minute from Rodriguez and Surtees. Elford was going great guns in 4th, from Stewart, both one lap down, McLaren, Rindt, Hulme and Attwood two laps down and Amon, Courage, Beltoise and Siffert three laps back. The Brabham team were having a miserable race; Rindt was driving around sitting in a pool of fuel, while Brabham was in and out of the pits with constant fuel pickup problems. Beltoise was slowing, while Amon’s Ferrari still sounded dreadful. After 34 laps Ickx had extended his lead to 85 seconds over Rodriguez, while Surtees raced into the pits for new goggles after deciding discretion was the better part. He re-emerged just ahead of Stewart. Ickx now underlined his superiority by lapping Surtees, while further back Courage moved up when Rindt decided enough was enough and retired. Rodriguez’s excellent drive came to an abrupt end 15 laps from home when he started having gearbox problems. When he arrived in the pits damage to the fuel pipe was also found, probably from running over debris from Schlesser’s accident, and he was forced to retire. It was really bad luck for the Mexican, who had impressed many with his drive. Ickx duly reeled off the final laps to take an extremely comfortable win. It was a dominant performance from Ickx, the Belgian’s first GP win being Ferrari’s first win since the Italian GP of 1966. Surtees unlapped himself and came home second 2 minutes in arrears, ahead of Stewart’s Matra. Elford covered himself in glory with a brilliant 4th place in his first GP, followed by Hulme and Courage, who took the final point on offer with his 6th place. 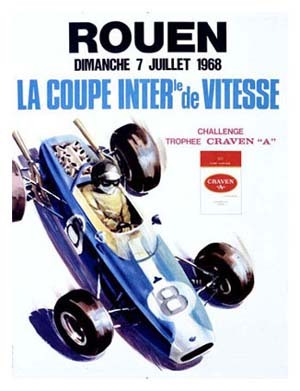 The 1968 French GP was a watershed for Rouen. The dreadful accident and death of Jo Schlesser underlined the fact that F1 cars had become too powerful for the circuit. 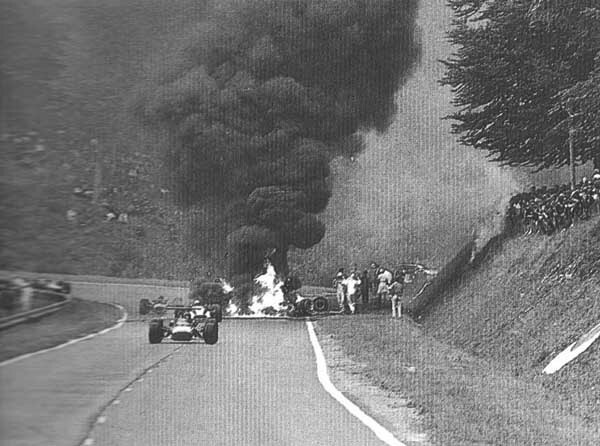 Indeed, some considered the circuit too dangerous for any racing, this view supported by the numerous injury-causing accidents of previous years, as well as the death of Bernasconi at Six Frères the previous year. The lack of run-off area was a huge problem; any mistake would be punished by a frightening trip into the ravine, or an impact with a tree or barrier. This, coupled with the deteriorating facilities, especially the dilapidated pit/paddock area, meant F1 would not be returning until something was done. The ACN tried to do something about it building a new pit area in 1972. But continual safety concerns over the next few years, and further deaths in lower Formulae races, sealed Rouen’s fate. 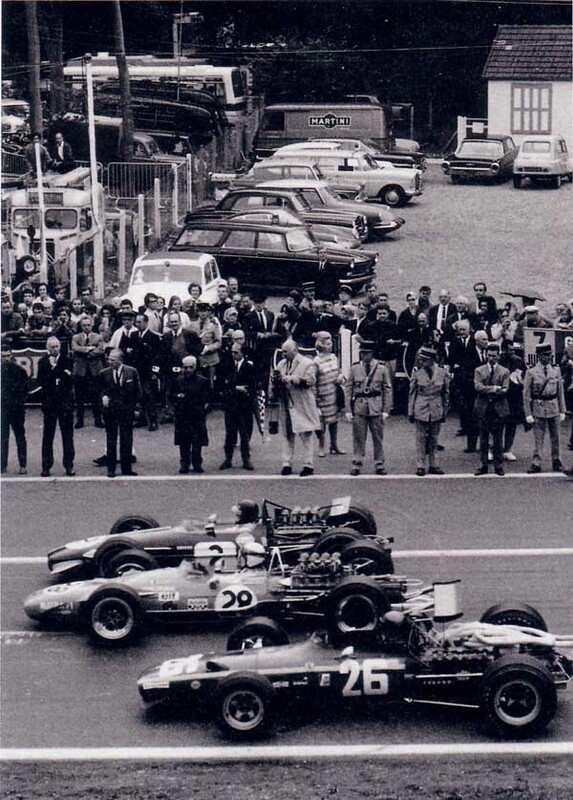 Never again would motor racing’s premier category grace the streets of Rouen-les-Essarts. An era had come to an end. The 1968 F1 event was supported by a number of races, including a Formula France race, and the ever popular Renault Gordini bash. The most important support race though, was the running of the annual International Coupe de Vitesse for F3 cars, which attracted a good number of European F3 stars. Roy Pike in his works Titan dominated practice, grabbing pole with a 2m 20s lap, a full second faster than Henri Pescarolo’s fastest lap in his Matra the previous year. Polish driver Adam Potocki was next in his Matra with a time of 2m 21.7s, with Mo Nunn equalling that time in his Lotus 41. Peter Westbury in a Brabham and Francois Cevert’s Tecno both managed laps of 2m 22s to line up on the second row, with the Martini of Vigoreux, Jabouille’s Matra and Depailler’s Alpine making up row 3. The time allowed for the F3 drivers to practice was markedly less than for the F1 drivers, and the F3 drivers had to qualify. A large bunch of cars got away from the line in a group at the start, with Potocki, Nunn, Vigoreux, Pike, Cevert, Westbury, Peter Gordon’s Titan, Depailler, Walker and Jabouille fighting it out. Jabouille had made a poor start, but rectified things with the fastest lap of the race on lap 2, a 2m 20.5s. The Pygmees of Patrick Del Bo and Eric Offenstadt led a second group of cars, with Francois Mazet close behind them until his engine failed on lap three. Westbury’s spin at Scierie broke up the leaders a bit, the Brabham just missing Cevert but collecting the unfortunate Vigoreux, putting both out on the spot. Gaydon retired soon afterward, and after briefly taking the lead Cevert retired with a blown head gasket. Nunn then had an off at the treacherous Scierie, leaving Potocki to reel off the remaining laps and take a surprise win. Pike collected second, ahead of Jabouille, Walker and Depailler. Bernard Baur in the Brabham managed to muscle his way ahead of the Pygmees into sixth, with Gerbault’s Brabham home in ninth.